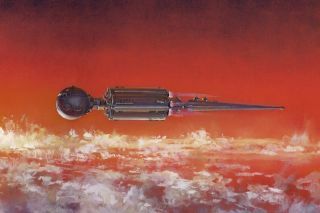 An early production painting of "Discovery" closely matches the description of the ship in Arthur C. Clarke's novel "2001: A Space Odyssey." Piers Bizony is a science writer and author specializing in the history of space exploration. His newest book "The Making of Stanley Kubrick's '2001: A Space Odyssey'"(Taschen, 2015) is an inside look at the making of the iconic film. Bizony contributed this article to Space.com's Expert Voices: Op-Ed & Insights. In 1968, filmmaker Stanley Kubrick and his screenwriting colleague, science fiction author Arthur C. Clarke, presented "2001: A Space Odyssey," an almost documentary vision of how engineers and scientists of the time envisioned the future of spaceflight, the prospects for artificial intelligence and the likelihood of contact with extraterrestrial life. The movie's famous opening scene shows prehistoric ape-men struggling for survival, until a mysterious, monolithic, black slab implants in one of them the transformational idea of bone tools and weapons. The film then skips 4 million years in a single frame, and we're on our way to the moon, where another, buried monolith awaits its discoverers. A publicity photo from "2001: A Space Odyssey" shows lead actor Keir Dullea as astronaut Dave Bowman (at left) conferring with co-star Gary Lockwood (Frank Poole) inside an EVA pod. So what did we just watch? Audiences were thrilled by the enormity of these ideas, conveyed in images of stunning artistic and technical quality. Not long after the initial release, I nagged my mom and dad until we went to see it at the local movie theater. I was thrilled — blown away — by everything I saw. I was also confused as heck, but the worst moment came when we piled out onto the street, and my parents asked me, "What was all that about? Did you understand it?" Somewhat taken aback by their question, and also not sure I had quite figured out the meaning of what we'd seen, I blurted out, "You're not supposed to understand it. You're just supposed to watch it!" Now, nearly five decades later, I still agree with my 10-year-old self. "2001" wasn't just the story of a journey to Jupiter. It was an unprecedented virtual-reality experience of spaceflight that allowed us to share the ride. Kubrick's large-format production, shot on a special new version of Cinerama, was a forerunner of today's IMAX shows. Actors and crew from "2001: A Space Odyssey" relax after completing photography in a set representing a huge lunar pit where a strange black monolith has been excavated. Even as a kid, I knew I wanted to make a book about how "2001" was created. It took a while, but a slender paperback of mine, "2001: Filming the Future" (Aurum Press, 2000), was published about 20 years ago. Kubrick looked at early proofs, sent to him by Arthur C. Clarke, whom I had gotten to know quite well by that point, because I was helping to archive that portion of his papers and manuscripts that were held in the U.K. rather than his home base of Sri Lanka. I was terrified that Kubrick would refuse permissions or, worse still, just give no response at all, but Arthur kept pushing on my behalf, and eventually, I got a call from Anthony Frewin, one of Kubrick's trusted aides. "Stanley really likes the fonts," I was told. "We look forward to seeing the finished book." At that time, the studio ownership of "2001" was a tricky matter. I did hear from a studio lawyer that my book might be in danger of infringing copyrights. I phoned Frewin, pleading for help. He said, "Right-oh," or some other cool English phrase, and I never heard from the lawyer again. When Kubrick died in 1999, I was distraught. His tacit approval for "Filming the Future" kicked off my long career in books. Jump cut to fall 2012, when I approached the Kubrick family once more. I asked if there was any way I could have access to Stanley's archives and turn "Filming the Future" into something more substantial. By now, Hollywood behemoth Warner Bros. was securely in charge of Kubrick's cinematic legacy (with one or two exceptions). There was no dodging the lawyers this time, but Kubrick's wife Christiane, and her brother Jan Harlan, were supportive, and offered to help clear the way. Eventually, I had a contract from Warner Bros. enabling a new book. A lot more contractual paperwork piled up, from the Kubrick family and from the University of the Arts London, which manages and preserves the actual physical archive. Finally, there was a deal with Taschen, the premium book publisher based in Cologne, Germany, chosen because of its previous close relationship with the Kubricks. All that administration took up the first six months of my three-year personal odyssey. Then came archive trawling, image scanning, careful digital retouching and color-balance repairs to half-century-old images. Oh, then there was writing the book, expanding my old 30,000-word text into something more than three times longer. Then came the collaboration with Taschen's chosen graphic designers, the M/M Company in Paris. One of the designers went off to Mexico for a spell, so I was soon fielding phone calls in three different time zones. When M/M told me it wanted the book to be in the shape of a monolith, I was very worried. No book can be that shape! Of course, breaking all the rules turned out to be an excellent reason to go ahead and do it. Just like the movie "2001" itself, some people love the format, while others hate it. We had to go with the courage of our ideas, and take our chances. This 8-foot diameter model was used for the rotating space station sequences in "2001: A Space Odyssey". Sadly, the model no longer exists. So what is it about "2001" that makes it worth yet another book? Basically, this movie never seems to get stale. The obsessively detailed hardware on screen still amazes audiences today. Douglas Trumbull was just one of dozens of young effects artists recruited for the production, which took four years to complete. When I asked him about the sense of realism conveyed by the film, his reply was enthusiastic. "You walked onto those spacecraft sets, and everything was as real as it could be," he said. "No one had ever done anything so convincing up to that time. Special effects now are dependent on computer graphics. I think a lot of depth and impact has been lost in the process." For the interior of the film's Jupiter-bound spaceship Discovery, Kubrick represented artificial gravity using a spectacular "centrifuge," a spinning drum 38 feet (12 meters) in diameter, weighing 30 tons, and fitted with control consoles, space food dispensers and astronaut couches. All of these details were built at full scale for the actors to interact with, essentially by working inside the drum like hamsters in a giant wheel. Clarke's brother, Fred Clarke (a central-heating engineer whose math-laden book on the subject became a standard trade reference), thought that the centrifuge construction was so good, "you could almost imagine they were building a prototype for the real thing." As Trumbull explained to me, "You had sets that were completely 360-degree enclosed. Architecturally, the lighting was built into the structures in a naturalistic way. The actors and the production team felt they were in a genuine environment." This recollection was echoed by the movie's lead actor, Keir Dullea, who played astronaut Dave Bowman. A few years ago, while I was making a documentary about “2001” for British TV, Dullea told me, "There were certain shots when we would lean forward and turn on the camera ourselves, because there was nowhere safe for the cameraman to go, or he'd be in the frame. Then, we'd get into position, and they would start up the centrifuge wheel, and you'd have an everlasting tracking shot. You would just walk, or jog, and the wheel would revolve around you." Perhaps for the first time in a major fiction film, Kubrick introduced the idea of futuristic props and sets as principal performers in the drama, in some ways more important than his human actors. "There's a deep emotional relationship between man and his machines, which are his children," Kubrick said at the time. "We have always worshipped beauty, and I think there's a new kind of technological beauty in the world." A detail of the Jupiter spaceship Discovery interior, from where the EVA pods are despatched into space. The sets from the film "2001: A Space Odyssey" were built half a century ago, but still seem fresh and modern today. What did they get wrong? What did they get right? Kubrick's exploration of humanity's place in the universe was informed by the best industrial expertise of the time. His technical adviser, Frederick Ordway, had worked with aerospace engineer Wernher von Braun and the Future Projects Office at NASA Marshall Spaceflight Center before being lured to the more glamorous world of film. Ordway soon discovered that "Stanley was a maniac for detail. Everything on screen had to be justified scientifically." Ordway and his colleague, production designer Harry Lange, visited countless British and American aerospace and computer companies in search of realistic hardware ideas. Most of their research still holds up amazingly well today. Where "2001" made technical errors, it did so in ways that turned out to be flawed rather than plain wrong. For instance, while the giant Discovery spacecraft is incredibly convincing, the lack of airtight docking ports seems odd today. But we have to remember that when "2001" first went into production in the early 1960s, space docking had not yet been tried, let alone perfected. On the other hand, spaceship Discovery's three single-seater "EVA pods" look so superbly designed, it seems a crying shame they do not exist in real life. Noordung predicted that weightlessness would play havoc with the human balance system. His design influenced a generation of astronautics engineers, including von Braun, whose wheel-shaped station designs were an obvious influence on "2001." The primary purpose of a space station would be to serve as comfortable accommodation for humans in orbit. Artificial gravity must surely be required to keep them healthy, everyone once thought. Today, we have different priorities. The International Space Station exploits, rather than counteracts, weightlessness in order to conduct experiments that are impossible on Earth. The station in "2001: A Space Odyssey" is "wrong," therefore, but for an interesting reason. Maybe one day it will be matched by a similarly grand real-life equivalent. The major problems with the film's predictions are social and political, rather than technical. When "2001" was released, NASA was about to send astronauts to the moon, and it looked as if space was set to become what the Internet is for us today: the "happening thing." Unfortunately, NASA's consumption of tax funding could not be sustained. Americans are a long way from building the lunar settlement depicted in "2001," let alone swinging past Jupiter in a giant nuclear-powered spaceship equipped with artificial gravity. Keir Dullea, as astronaut Dave Bowman, explores the eerie hotel room in the finale of "2001: A Space Odyssey", in a scene deleted from the final film. Short of wormholing toward an alien encounter, we probably could accomplish most of what we see in "2001" if we really wanted to. So why haven't we? "2001" can be thought of as a nostalgic monument to the dreams of a previous generation, but it still serves as a powerful manifesto for contemporary space activists. Perhaps entrepreneurs driving the nascent private rocket business have itchy feet precisely because of what they saw on screen as youngsters. If Kubrick and his team could deliver such a compelling vision of astronautical progress all those years ago, how come we are still struggling to turn so much of it into reality, what with all the smart technologies available to us now? In November 2011, Peter Diamandis, founder and chairman of the X Prize Foundation, told The Huffington Post that "2001" had been hugely influential, "But, as time progressed, the dream began to disappear," he said. "We saw a string of horrendous accidents, including the 1986 Challenger explosion." Despite such setbacks, including with Virgin Galactic's SpaceShipTwo, rocket planes could become the basis for a new industry. Virgin Galactic CEO Richard Branson is just one of many space innovators who acknowledge Kubrick's film as a call to arms. In January 2010, Branson told Postmedia News reporter Alex Strachan, "'2001: A Space Odyssey' was magnificent, and I hope that one day Virgin Galactic will be going a lot further than just suborbital flights, and will reflect that film." Kubrick and Clarke knew perfectly well that private corporations would have to play just as great a role as government space agencies in getting people into orbit. A large section of the giant rotating space station in "2001" was occupied by a familiar hotel company, Hilton. A winged Pan Am space shuttle delivered the guests, and Honeywell and IBM built the control consoles. The fact that one or two of those companies have faded over the intervening years doesn't in any way diminish the key point. The orbital realm will evolve into a corporate space, because the money for all those toys has to come from somewhere. Box cover art for Taschen by Wayne Haag, based on elements from "2001: A Space Odyssey" elements. Hardware enthusiasts love to argue the merits of the film's finer details, but there's no doubt that it sets up a series of huge challenges that don't yet have any answers. Can we send humans across the solar system, or will deep space elude our dreams of colonization forever? Right now, it's hard to be sure. Where is HAL 9000? Is he impossible to build, or will he and his kind yet supplant us as the dominant species? We don't know yet. And where, oh where, are the extraterrestrial intelligences that so many scientists insist must be out there, but from which we have yet to hear a single bleep? Again, we don't know. Just as in 1968, we may be teetering on the brink of discoveries that can answer some, or perhaps even all, of those questions. For now, we continue to wait with baited breath. As Arthur C. Clarke wrote in his generous foreword to my first book, "Historians in some far distant future will, no doubt, regard the current half-century delay in our plans as nothing more than temporary, a brief hiccup in the greater span of events." In the meantime, so long as we continue to wonder about our place in the cosmos, and our relationship with emerging technologies, the questions posed by Kubrick and Clarke's "2001: A Space Odyssey" will stay as fresh and timely as ever.